A little white mouse comes running to a frog to ask for help because Big Bro’s coming: “He’s rough, he’s tough, and he’s big.” The mouse stretches his arms out as wide as he can to show just how big, then he runs away to hide. The worried frog conveys the same information to a parrot before hopping off to hide as well. The parrot tells the story to a chimpanzee and stretches out his wings to show just how big Big Bro is, but of course his wing span is far greater than the span of the mouse or the frog’s arms. By now it seems as though Big Bro really must be a fair size and a creature capable of striking fear in the heart of any other animal. The parrot flies off to hide in his turn, and the chimpanzee rushes to tell an elephant about Big Bro. The chimp can stretch out his arms even wider than the parrot’s wings, so the elephant decides that there is good reason for them both to hide. The animals are all huddled together and the elephant thinks one of them should creep out and have a look around. They are, however, all terrified, but the little mouse bravely offers to go. He soon rushes back, shrieking that Big Bro is on his way and that they must hide. The animals all cover their eyes in trepidation as they hear footsteps. When they finally discover that Big Bro is in fact a mouse, albeit a largish one, they comment on how tiny he is. Not wishing to be made to look a fool, Big Bro takes a deep breath and shouts “BOO!” which really makes the animals jump. The story ends with Big Bro marching his little brother off home while the others remark that he really is rough and tough. Jez Alborough’s “Watch out! Big Bro’s Coming” is a simple but effective story that cleverly uses the idea of size and builds the tension up gradually for a young audience. This is a great book for talking about the various animals and how big they are, and how likely they are to be frightened of other creatures. There is plenty of humour and repetition to keep a young child’s interest throughout the story. The text is in a large, clear font that is superimposed on the illustrations, usually on a light blue background so there is no difficulty in deciphering it. On average there are about ten lines per double page, occasionally more but sometimes less. A two-year-old child might be impatient to turn over, but a slightly older child will enjoy taking in the illustrations while listening. A child who is gaining confidence in reading would probably not have too much difficulty tackling “Watch out! Big Bro’s Coming”. Rough, tough and chimpanzee may not be the easiest words to read, but there is enough repetition of sentences throughout the book to making reading the story not too challenging. Alborough illustrates his own picture books, and this one is particularly colourful and appealing. There is always a bright blue sky and plenty of greenery; while the mouse, chimpanzee and elephant are rather neutral colours, the parrot is a beautiful yellow, orange and red plumed bird and the frog is rich green and yellow. The animals usually have wide-eyed, open-mouthed, flabbergasted facial expressions that bring each illustration to life. “Watch out! Big Bro’s Coming” has proved to be one of the most popular picture books that I have successfully used as the basis for a drama session with a group of four-year-old children. Almost all children love pretending to be animals, making the appropriate noises and hopping or flapping their arms like wings. It is an ideal length, and the children enjoy hiding and whispering while waiting for Big Bro to arrive. The story obviously captured their imagine, as they were still saying “Big Bro’s coming” during an outdoor play session after the drama. I had suggested that before they go off to school in September we might repeat some of their favourite dramas, and they said that this would definitely be one of their choices. 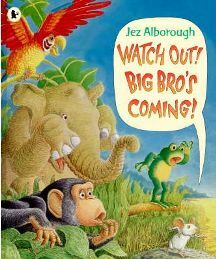 It is hard to go wrong with Jez Alborough, and if you and your young family have not yet become familiar with his picture books, “Watch out! Big Bro’s Coming” would be an ideal one to start with. It is likely to appeal to both boys and girls from the age of two up to five or six. It’s great fun for reading aloud, and I thoroughly recommend it. No Comments on "Watch out! Big Bro’s Coming"